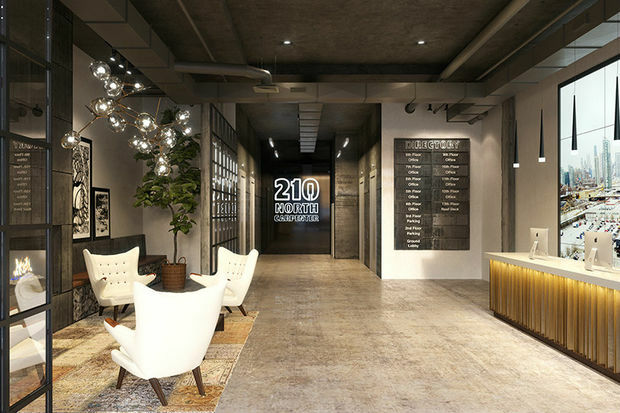 Developer Sterling Bay plans to build an office building at 210 N. Carpenter St. in the West Loop. WEST LOOP — A group of neighbors living near the site of a proposed 13-story office tower in Fulton Market are making moves to block the development. The new group, called Friends of Fulton Market, said developer Sterling Bay's planned 186-foot tall building at Lake and Carpenter streets is too tall for the immediate neighborhood and would "dwarf" surrounding historic properties. The group has launched a petition and is circulating fliers asking Ald. Walter Burnett Jr. (27th) to reject a zoning change that would make way for the new building. Calling the project McDonald's "Vendor Village" in a recent meeting, Sterling Bay Principal Andy Gloor said the office building will likely attract vendors and suppliers that work with McDonald's as the fast food giant plans to move its corporate headquarters to the the West Loop. The building could bring 1,000 new employees to neighborhood, Gloor said. "We have a number of McDonald's vendors who were in Oak Brook and want to come Downtown," Gloor said. "We're calling it, internally, 'Vendor Village.'" Under plans, the 210 N. Carpenter project would include street-level retail and 94 parking spaces, according to a zoning application. The site, on busy Lake Street, is one block west of the CTA's Morgan "L" stop. The group opposing the project includes neighbors living in Blue Moon Lofts, a condo building adjacent to the planned 210 N. Carpenter project. While the proposed site for the 13-story office building would be just outside of the boundaries of the historic Fulton-Randolph Market District, the six-story Blue Moon Lofts building at 215 N. Aberdeen St. is one of 87 buildings that were designated as historic landmarks when the landmark district was approved in September 2015. Because of its landmark designation, the 70-foot condo building has to adhere to strict redevelopment rules. Sheila McCormick, who lives in Blue Moon Lofts, said the landmark rules were put into place to protect the character of the neighborhood. "We're going to have this little dwarfed building next to this giant high rise [when] we went to the effort as a city to preserve this landmark district," she said. Friends of Fulton Market is pitching new development guidelines that would cap building heights in an area bounded by Halsted, Racine, Carroll and Washington. The proposed guidelines would not allow developments adjacent to residential landmarked properties to be taller than the landmarked building. 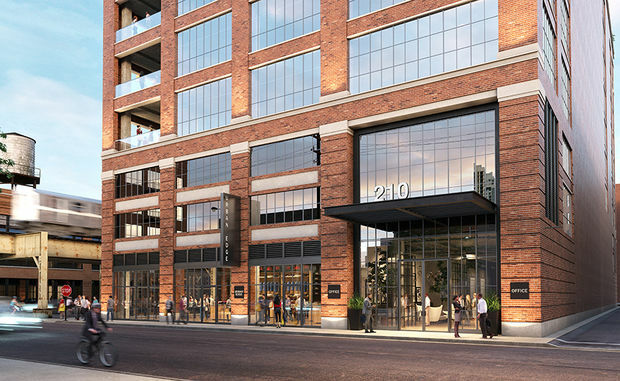 All new construction in Fulton Market could not exceed the height of 1K Fulton, home to Google's Chicago headquarters. The new guidelines would protect the quality of life of current West Loop residents while preserving the legacy of then historic district, according to a letter from the group to Burnett. J.T. Belknap, president of Blue Moon Lofts, said families bought homes in the building with the expectation that city zoning laws would protect the "modest density" buildings in the neighborhood. “Without any community input, elected officials at City Hall arbitrarily extended the possibility of downtown zoning to our neighborhood even though matching the new building’s height to ours is consistent with Blue Moon Lofts’ status as an official City of Chicago landmark," Belknap wrote in a letter. Gloor, the building's developer, said that the former building on the site wasn't landmarked because the dilapidated structure wasn't architecturally significant. The project's proposed height is "reasonable" when compared to other proposed developments on Lake Street, he said. "'The neighborhood is going through a transition," Gloor said. "Four or five years from now, I do think there are going to be much taller buildings than this." Kathleen Fitzgerald, who owns a condo in Blue Moon Lofts, said the new building would reduce property values in her building. "These are our streets, our family homes, our neighborhood," she wrote in an e-mail. The voters of the 27th Ward should be the ones to determine "whether this site gets a zoning change and how big." Under current plans, Sterling Bay plans to dedicate two floors in the building to parking. 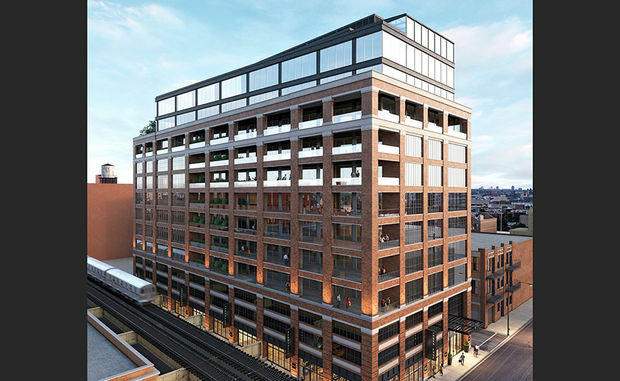 Friends of Fulton Market is instead asking the developer to build the parking underground. After a recent meeting, Burnett said that he would ask Sterling Bay to explore alternative plans that could reduce the height of the building, including moving parking underground. "We'll see if they will make some adjustments," the veteran alderman said. Neighbors also worry that adding 1,000 employees to the corridor cause more accidents on overcrowded Lake Street. Brian Lang, who lives at 1101 W. Lake St., said Lake Street is already "too dangerous." "Erecting high-rise buildings on our small residential streets will simply make our neighborhood even more dangerous for foot and automobile traffic," Lang said. Burnett said earlier this month that a stop sign at Lake and Carpenter and a stoplight at Lake and Morgan are in the works. Sterling Bay filed in September to re-zone the property, city records show. Under current zoning, a five-story building could be erected at the site, said Erin Lavin Cabonargi, director of construction at Sterling Bay. The developer also plans to apply for a density bonus through the city's Neighborhood Opportunity Fund, which would generate about $2 million for the new development fund. Burnett said a portion of the funding would support a planned library in the West Loop. If approved, the new Carpenter building could open by early 2018, according to Sterling Bay's website. 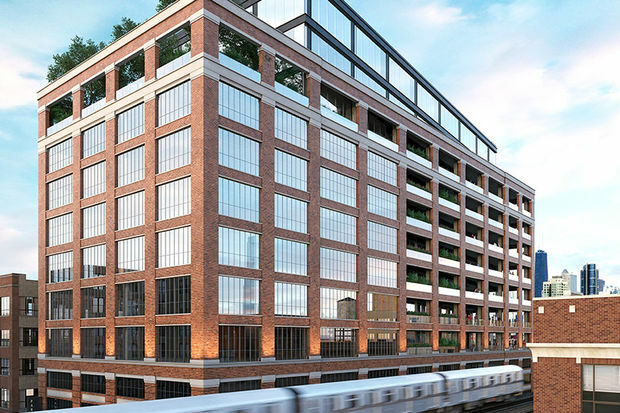 Sterling Bay is also overseeing the development of the new McDonald's corporate headquarters and previously redeveloped the former Fulton Market Cold Storage building into 1K Fulton. Friends of Fulton Market is asking Burnett to announce his decision on the zoning request by Dec. 2. The group plans to hold a press conference at Sterling Bay's West Loop headquarters on Dec. 3, according to Fitzgerald. If Burnett does sign off on the zoning change, Fitzgerald said that all options — including a potential lawsuit — are on the table. "However, we remain hopeful that Ald. Burnett will listen to his constituents and do the right thing," she wrote in an e-mail. "After all, Burnett asked for our support to landmark our district, and now we're asking for his support to preserve our landmarked homes." In August, a group of West Loop neighbors who fought the controversial 111 S. Peoria St. development for more than two years filed a lawsuit against the city and developer LG Development. After much debate in the neighborhood, the 115-foot project was approved by the City Council in May. Despite the pending lawsuit, the developer still plans to break ground on the condo project, now called Illume, on Dec. 1, Crain's reports.